Scalding is an in-house MapReduce framework that Twitter recently open-sourced. Like Pig, it provides an abstraction on top of MapReduce that makes it easy to write big data jobs in a syntax that’s simple and concise. Unlike Pig, Scalding is written in pure Scala – which means all the power of Scala and the JVM is already built-in. No more UDFs, folks! This is going to be an in-your-face introduction to Scalding, Twitter’s (Scala + Cascading) MapReduce framework. Not much different from the Ruby you’d write to compute tweet distributions over small data? Exactly. This Github repository contains all the code used. For a gentler introduction to Scalding, see this Getting Started guide on the Scalding wiki. Imagine you run an online movie business, and you want to generate movie recommendations. You have a rating system (people can rate movies with 1 to 5 stars), and we’ll assume for simplicity that all of the ratings are stored in a TSV file somewhere. Let’s start by reading the ratings into a Scalding job. You want to calculate how similar pairs of movies are, so that if someone watches The Lion King, you can recommend films like Toy Story. So how should you define the similarity between two movies? Let’s start with the first two steps. 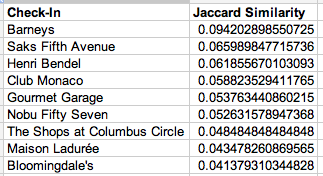 Before using these rating pairs to calculate correlation, let’s stop for a bit. So let’s go back to calculating the correlation between movie and movie2. We could, of course, calculate correlation in the standard way: find the covariance between the movie and movie2 ratings, and divide by their standard deviations. And that’s it! To see the full code, check out the Github repository here. Let’s run this code over some real data. Unfortunately, I didn’t have a clean source of movie ratings available, so instead I used this dataset of 1 million book ratings. Of course, there are lots of other similarity measures we could use besides correlation. Cosine similarity is a another common vector-based similarity measure. We can also also add a regularized correlation, by (say) adding N virtual movie pairs that have zero correlation. 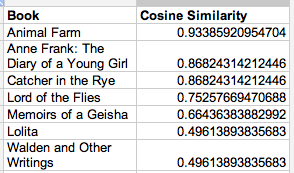 This helps avoid noise if some movie pairs have very few raters in common (for example, The Great Gatsby had an unlikely raw correlation of 1 with many other books, due simply to the fact that those book pairs had very few ratings). Recall that one of the lessons of the Netflix prize was that implicit data can be quite useful – the mere fact that you rate a James Bond movie, even if you rate it quite horribly, suggests that you’d probably be interested in similar action films. 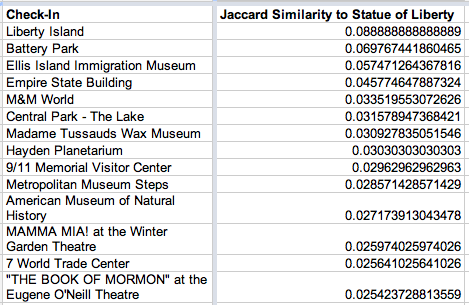 So we can also ignore the value itself of each rating and use a set-based similarity measure like Jaccard similarity. Finally, let’s add all these similarity measures to our output. Let’s take another look at the book similarities above, now that we have these new fields. 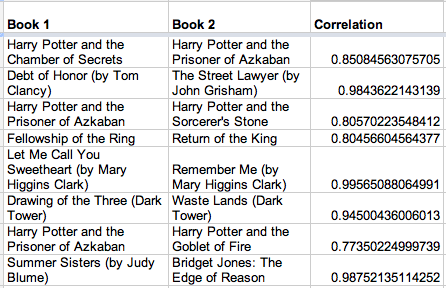 Notice how regularization affects things: the Dark Tower pair has a pretty high raw correlation, but relatively few ratings (reducing our confidence in the raw correlation), so it ends up below the others. So our code right now is tied to our specific ratings.tsv input. But what if we change the way we store our ratings, or what if we want to generate similarities for something entirely different? Whenever we want to define a new input format, we simply subclass VectorSimilarities and provide a concrete implementation of the input method. The input method simply reads from a TSV file and lets the VectorSimilarities superclass do all the work. Instant recommendations, BOOM. 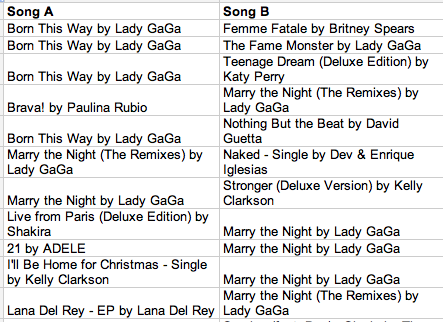 Since iTunes lets you send a tweet whenever you rate a song, we can use these to generate music recommendations! But what if we don’t have explicit ratings? For example, we could be a news site that wants to generate article recommendations, and maybe we only have user visits on each story. Or what if we want to generate restaurant or tourist recommendations, when all we know is who visits each location? Instead of using an explicit rating given to us, we can simply generate a dummy rating of 1 for each check-in. 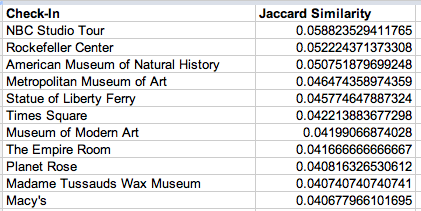 Correlation doesn’t make sense any more, but we can still pay attention to a measure like Jaccard simiilarity. Run through this code-based introduction, complete with Scalding jobs that you can run in local mode. Browse the API reference, which also contains many code snippets illustrating different Scalding functions (e.g., map, filter, flatMap, groupBy, count, join). And all the code for this post is here. Watch out for more documentation soon, and you should most definitely follow @Scalding on Twitter for updates or to ask any questions. And finally, a huge shoutout to Argyris Zymnis, Avi Bryant, and Oscar Boykin, the mastermind hackers who have spent (and continue spending!) unimaginable hours making Scalding a joy to use.